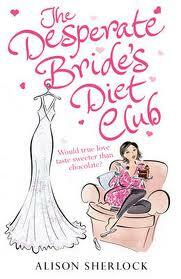 The Desperate Bride's Diet Club arrived through the post at the most perfect time for me having just started my diet I could easily relate to the characters and their situations. The book follows the progress of five characters who, for their own individual reasons want or need to lose weight. Although our main character is Violet who is a size 20 unhappy bride to be, the story still moves around each of the characters so we get to see first hand how each of the characters are coping. I had mixed feelings about the is book at the beginning, I found the first chapter so entertaining I literally laughed out loud I found myself thinking that Violets actions would have been something I could imagine myself doing! (sorry I can't tell you in more detail, otherwise it may ruin the humour for you!). After the first chapter we meet each of the other characters in turn, we have Lucy, Maggie, Kathy and Edward. It was at this point I was a little worried meeting so many leading characters, as books like this I usually find I get the characters mixed up and forget who is who. Luckily this wasn't the case by the time I was just under a quarter of the way through, each of the characters had been developed so well that each character came into their own as they all had completely different backgrounds and reasons to lose weight. I loved how the group all came together to help each other out not just with the weight loss but other personal and realistic problems too. Although the books was based around the diet club there were no quick fixes or fad diets the book really helps you to remember the only sensible way to lose weight is to change your eating habits and move your bum! I found that reading this book really helped to keep me motivated on my diet. I really enjoyed the parts of the book where Violet goes to the Gino's Delicatessen, this is where I felt the authors writing was at its best. I can only imagine from the passion that comes across when talking about her visits and anything to do with the topic of Italy, that this must be a subject close to the authors heart. I really enjoyed this book and I would definitely look out for future books by this author. If you are on a diet I urge you to read this to give you some much needed motivation and a lot of laughs! A slice of Humour, A splash of romance for a guilty pleasure! There are just too many diets and fads diets available today. I've found the 5 best diets to lose weight fast with. I have my own personal favourite which is a combination of three variations of the Scarsdale Diet with my absolute favourite being the economy version of the diet plan, but more on that in a bit. In my opinion the Scarsdale Diet Plans offers the most choices in the way of options that you can eat and the prices of the foodstuffs recommended can be tailored to your own personal circumstances and budget.